This time the friend that had a 'friend' is a pretty sharp guy. He's a firefighter and that always gets you extra points from the get go in my book. Secondly, his 'friend' DID call and we had a great conversation. He asked if I had looked at any of their previous productions - I had not so he suggested that perhaps I should do so before continuing our conversation - which I did. They were AWESOME! The website is GuiltyHumor.com. I halfheartedly went to their site with the intention of watching one clip and ended up watching all of them! It is difficult to make me laugh and I was in tears by the time I was done. In a nutshell I was hooked. I immediately called back and asked what the concept was that they wanted help producing. "We want to make a rap anthem music video featuring.... Jesus Christ", said Matt Haught (1/2 of the Guilty Humor Team along with Josh Zimmerly). "uh-oh", I said nervously replied. Long story short: I agreed to do it. We decided that Easter Morning would be the most appropriate day to launch the video and went to work getting it on camera. 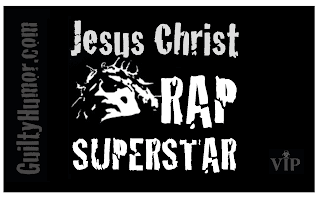 To see the teaser, please visit our website and to watch the world wide premiere of 'Jesus Christ Rap Superstar", please tune in at GuiltyHumor's Facebook Fanpage on Sunday April 24th, 2011.